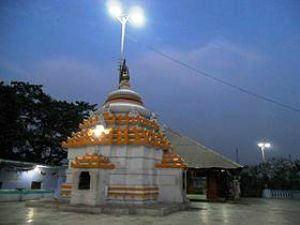 Charchika Temple is one of the oldest Shakta places in Odisha. The presiding deity is an eight-armed goddess Chamunda,locally known as Maa Charchika Devi. She is seated on a prostrate human body and wearing a garland of human skulls. She displays khadga, shula, katari and varadamudra in her four right hands whereas the four left hands represent severed head, blood-cup,"damru"and leaving a finger of the remaining hand soaked in blood. This temple is situated on the top a small hillock Ruchika Parvata on the bed of the Renuka river in the small town of Banki in Cuttack district of Odisha.The Charchika idol installed in this temple in Odisha is believed to be created by Parashurama. Among the famous temples in India, Charchika Temple houses beautiful and remarkable Jagamohana, Pidha Vimana and a wooden Mandaoa known as "Suryavahini Mandapa". Temples Odisha are always known for their grace and charm.